A long list of free amenities including Wi-Fi and hot breakfast and a good location impress our guests who stay at Wingate By Wyndham Rock Hill / Charlotte / Metro Area. This 91-room hotel on five floors offers both free Wi-Fi and free wired internet access in all rooms as well as microwaves and mini-fridges work desks free local calling and free newspapers each morning. The hotel also provides a free hot breakfast buffet every day; once a week a manager's reception provides free appetizers and beverages. The 24/7 business center provides free photocopying and faxing and when busy guests get a little downtime the outdoor pool and fitness center are just what the doctor ordered to keep them in shape on the road. Parking is free at this hotel. 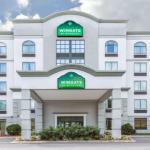 Wingate By Wyndham is off of I-77 less than a mile from Rock Hill Galleria. Family fun at Carowinds theme park is 20 minutes north right on the North Carolina border. Downtown Charlotte is about 30 minutes away; Charlotte Douglas International Airport is 25 miles from the hotel.